‘Colour Power & Identity’ is the title of a book chapter I’ve written for ‘A Cultural History of Colour: The Modern Age’. Edited by Sarah Street and Anders Steinvall; Series editors, Carole Biggam and Kirsten Wolf, to be published by Bloomsbury, London in early 2019. The chapter explores some of the ways that colour is used as a form of code intended to convey meaning linked to identity, persona, presence and power within a broader lexicon of visually-based signifiers has a long tradition and dates back to pre-literate cultures. The chapter examines this topic across a number of sectors: Politics, Branding and Marketing, Architecture, Literature, Cinema, Fashion Design and Social Media. In the political area, strong, saturated colors and individual style can definitely help to convey strength of character, courage and confidence – personal traits that are important and advantageous in politics. This is evident in Angela Merkel’s approach to fashion. Merkel has a notable preference for a certain style of jacket in different colours; typically a three-button jacket in a variety of saturated colours and fabrics to suit the occasion. 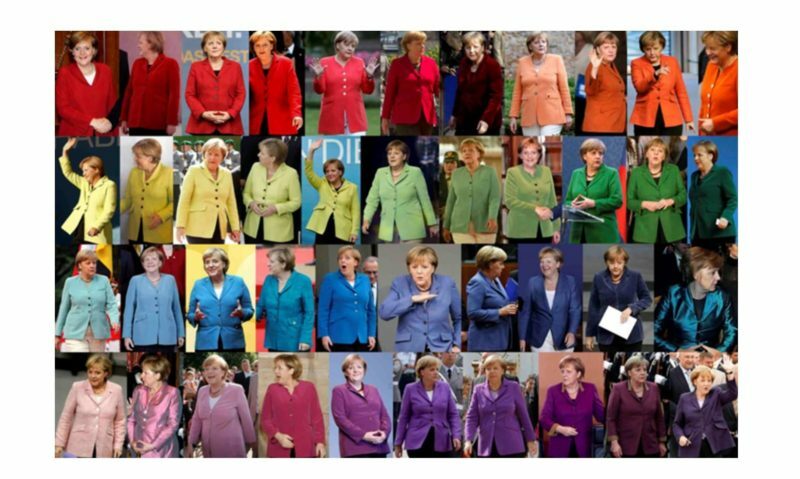 Merkel’s preference in this respect is so well known that Dutch designer Noortje van Eekelen created a Pantone-style colour chart featuring an array of Merkel’s jackets. Damian Gayle wrote an article ‘Fifty Shades of Angela Merkel’ which was published in the Daily Mail on 19 July 2012. You can read the full article here. Merkel uses a formulaic approach to colour and fashion that suits her, adds to her identity and supports her role as leader of one of the most powerful countries in the world. Previous Post @Cinema.Palettes in AD Mexico!